Flat B, 2/F 36 HaHeuing rd Tokwawan, Kowloon, Hong Kong. 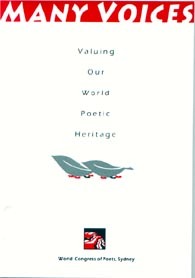 Valuing Our World Poetic Heritage 2000 Highlights included a very moving reading by refugee poets and a reading by the best known Korean poet Jung Ho-seung. His poems and paper are here. is over and was a great success. Thanks to the hard work of the Committee and others who ensured that the Chinese Visas came though at the last minute. Congratulations to the poets Michael Sharkey chose as outstanding from the anthology The Opening of Borders, Gabriel Planella, Dushan Ristevski and Louise Wakeling. There were six honourable mentions. Ludwika Amber, Joseph Baran, Robyn Ianssen, Craig Powell, Alice Sinclair and Nicolette Stasko. A CONGRESS FOR PEACE THROUGH POETRY! "Poetry for World Peace in the New Millennium." The committee organising the XXI World Congress of Poets in Sydney, includes Indigenous poets, and many Bilingual poets who write not only in English but also in Arabic, Chinese, Croatian, Polish, Spanish and Turkish. The Committee believes that through the arts and poetry in particular, we creatively explore our relationships with each other and our environments. The Sydney World Congress of Poets Committee looks forward to welcoming poets from across the world as well as the Australian poets and the public in general to take part in this exciting and wide ranging week of readings, workshops and literary events. The anthology launched contained brief descriptions of poetic traditions from over thirty countries and the prize winning poems from the Poetry Competition. This is the first time this world event will be held in the Southern Hemisphere. The most recent Congresses were held in Greece, Mexico, Slovakia, Korea and Japan. Poets from more than 50 countries will participate in Sydney in 2001, amongst them many famous poets who will be sharing their work and creative perspectives. Australia is ideally placed to hold such an event in view of the diversity of cultures and languages of poets living here. The event will showcase poets writing in English, particularly indigenous poets and those writing in a multitude of other languages in Australia. This festival of poetry from around the world will feature readings, workshops, get to know you sessions, panels, music, art and other cultural events. There will be sessions in English, Chinese, Arabic and Spanish and several other languages. Communities from across Australia are involved.